Submitted by VinaBleg on Mon, 03/07/2011 - 15:46. Submitted by Invitation on Fri, 03/04/2011 - 03:13. Submitted by LucyGerd on Fri, 02/25/2011 - 12:21. Submitted by MumunGreg on Wed, 02/23/2011 - 08:57. Submitted by josephine on Mon, 02/14/2011 - 02:34. No wonder why the wise men say that all you do in a lifetime, you definitely have to do it with patience. Statistics underline this in a very precise manner. The affordability rate goes down in a direct proportion to the expansion of the economical crisis. Me and my husband, we have been renting in the white city for a few years now, until we barely managed to buy our own house. It has only been a year since we finally managed to arrange the house after our own tastes, decorating the backyard, repainting the walls in all rooms, changing the Bathroom Vanities and the livingroom furniture. Each and every house accomodation improvement came slowly afterward, one small investment at a time. Submitted by DewsBrow on Sat, 01/29/2011 - 07:51. Submitted by JimS1203 on Mon, 01/24/2011 - 16:38. This reflects directly the data I saw recently in a presentation done by the HR services department at work. 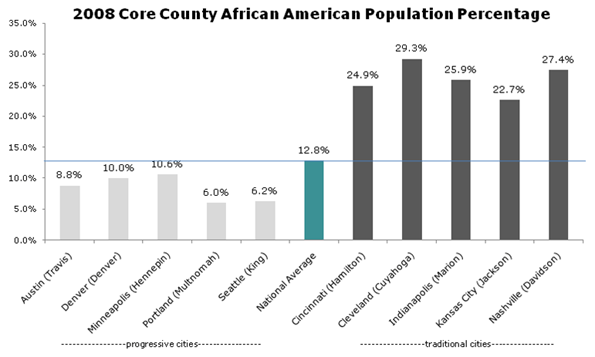 We're in Indianapolis, and it definitely seems right that though we're more "conservative" than many cities, we definitely have a higher African-American population -- greater diversity in general! It's a lot of fun to meet and learn from people who are not just the same middle class white as me. I think this helps make our city a first-class city. Submitted by avster on Sun, 12/12/2010 - 02:00. To me not planning for a truly diverse, progressive and accepting society is kind of like civic planning. If you don't plan for a road system that will be able to accommodate a growing population you will eventually have traffic, congestion and jaded people who feel forced to move to the next safe suburb. Submitted by sinecurious on Sat, 12/11/2010 - 12:35. I don't know how I found this blog or this particular article, but I had to laugh. It deserves a good flaming, though I suspect that the author is probably a good fellow. I realize this post is now over a year old, but folks have commented quite recently. I certainly agree that "progressive" cities "should not be self-congratulatory about it or feel superior about the urban policies a lack of diversity has enabled". Why is this? It's because most liberals are pathetic, lying hypocrites who refuse to speak the truth. My initial "drunk guy at the bar" response: What is it with (white progressive) people? "elle" from Brooklyn pretty much nailed it. How large, exactly, is the bubble that you people live in? About as large as Oregon, apparently. Why is it so lamentable that there are places where "diversity" is so lacking? Has the author ever lived in an area with a large black population? Has he ever even lived on the fringes of a black neighborhood? Has he ever had to "Deal" with that kind of crap, ever? Was the author ever the only white person on the school bus, classroom, etc.? Has he ever been stabbed in the leg with a pencil (punched, spit on, verbally abused, etc. )...for being the only white person in the classroom? Be careful what you wish for, is all I can say. I live in fairly blighted, impoverished city in Upstate, New York which is about 12% black. The town is largely segregated, but there are neighborhoods that are "mixed". I probably live in the whitest part of town. 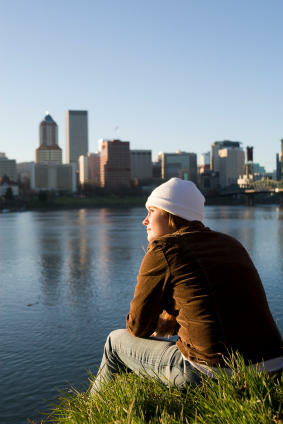 I am not a townie; I have lived in the urban yuppie places. I would challenge anyone to break down the violent crimes committed in most any US city on the basis of race only. Stranger-upon-stranger violent crime (armed mugging and/or aggravated assault) is the clincher, since it's what makes people move away. That's what people generally mean when they say, "that's a bad area". Most people can deal with blight, junkies, and hookers, but not many people like it when someone sticks a gun in their face and says, "give it up, motherf*&cker!". That's no fun. Do you have lots of that in Portland? Davis Square in Somerville, MA? Austin? etc. etc. There is absolutely no excuse for armed mugging or unprovoked physical assault, even if you are poor and cannot find work. Be thankful that there are large cities in the United States where that kind of thing is relatively rare. In all ESSENTIAL respects more leftists of the oversocialized type want to make the black man conform to white, middle-class ideals. They want to make him study technical subjects, become an executive or a scientist, spend his life climbing the status ladder to prove that black people are as good as white. Why cannot you just accept that most African-Americans probably don't want to be around you (white progressives or whites in general)? They probably don't want to "enjoy" the things that white progressives find interesting, either. They don't want to listen to Stereolab or "This American Life", nor do they give a damn about whatever dumb fad is passing about through the white, liberal web/media Zeitgeist. Why don't you just relax and stop worrying about "diversity"? Diversity is bullsh&t newspeak. Get over yourself. If it really bothers you that much, you can always move to a more "diverse" area. Be a trendsetter, man! Submitted by adelisi on Thu, 12/09/2010 - 16:47. Thanks for the article, I appreciate your raising some interesting points, but essentially, most of your argument of "Whiteness" is incorrect. You can't measure whiteness by comparing % of black population. You realize that are many other races? I think your points are still somewhat valid from a 'class' discussion, but not a racial one. So I pulled some data from the American Community Survey 2009 (Census data), and although they don't classify Hispanic in the same way as other races, I'm just using their percentages anyway (I feel it's a fair comparison if you're applying it the same in all metros). This also doesn't take into account all the races that do not fit into Hispanic, Asian, or African American (Native American, Islander, etc). It's just an approximation, but closer than yours. 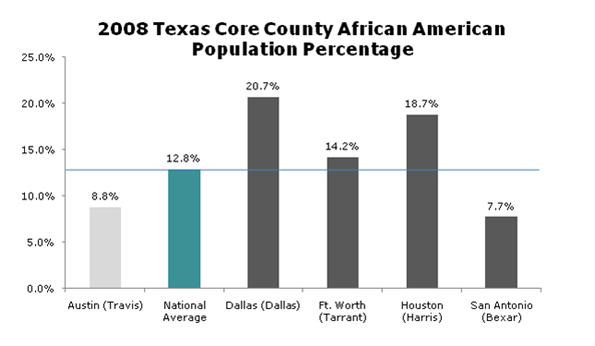 Austin MSA is 31% Hispanic, 5% Asian, and 8% African American, leaving the city 56% white. Minneapolis-St. Paul MSA is 5% Hispanic, 6% Asian, and 8% African American, leaving the city 81% white. 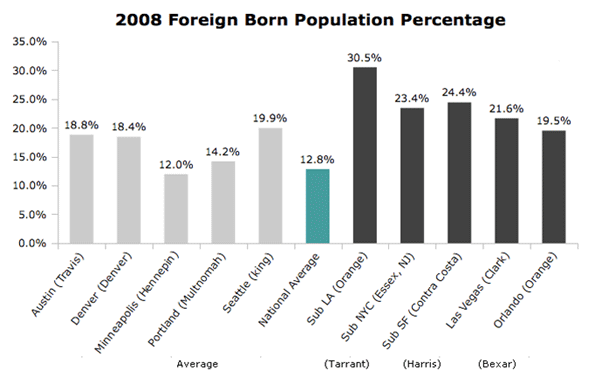 Portland MSA is 11% Hispanic, 7% Asian, and 4% African American, leaving the city 78% white. Cincinnati MSA is 2% Hispanic, 2% Asian, and 13% African American, leaving the city 83% white. So, Cincinnati is the whitest of these 4 cities. Yes, this is metropolitan areas, not JUST the primary cities, but anybody talking about cities today realizes that the borders don't end at the traditional city boundaries, and an analysis that doesn't look at metros is pretty bogus. What this DOES potentially show is some really interesting dynamics, where the so-called "progressive" cities that you're discussing, while less white than rust-belt cities, might have a higher concentration of white (or more realistically, better educated/higher income) people in the urban core. Whereas in the older, rust-belt cities that suffered through white flight for years, the poorer/minority population is concentrated in the urban core, with the wealthier (and generally whiter) population lying in the suburbs. So, there's certainly a lot to talk about, but The White City is clearly not an apt description.